On Sunday, Nov. 9, a group of young wrestlers accustomed to spending weekends performing mat drills, working arm bars and perfecting half-nelsons instead left the gym and worked as a team in another way—preparing and serving dinner to those visiting the Light of Life Mission. “North Allegheny wrestling is a unique group of boys, many of whom have been competing together for over 10 years, and they were looking for a way to play a meaningful role in the community,” explained Natalie Kalmeyer, concessions co-director, North Allegheny Varsity Wrestling Boosters. With the help of the North Allegheny wrestling team, Light of Life hosted their first Samaritan Supper last month, with volunteers preparing the meal off-site and then serving it at New Hope Church, a Light of Life partner. More than 110 poor and homeless men, women and children were served a meal consisting of barbecued ham, halushki, baked beans, southwest corn and peach cobbler. “We have been preparing meals for hundreds of athletes over the years for our large, regional tournaments, so we felt well-equipped to prepare this meal for these deserving folks,” said Kalmeyer. 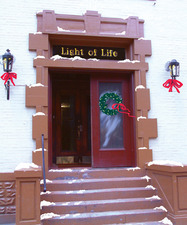 To learn more about Light of Life Mission, visit www.lightoflife.org.